Too much heat can harm your pet – watch the temperature! 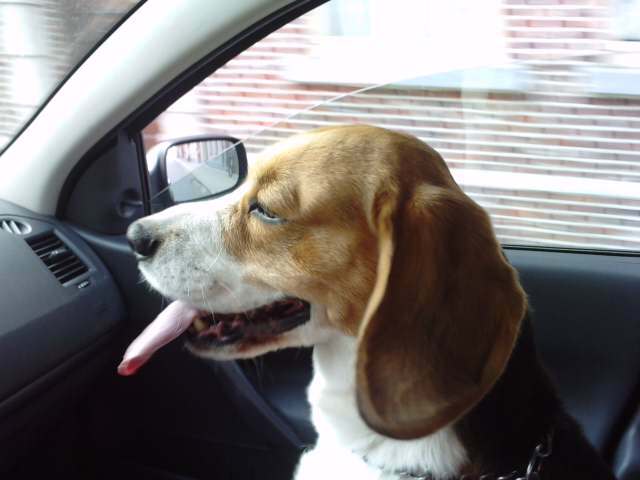 Our pets are our close companions, and for many people, it’s difficult (emotionally and/or logistically) to leave them behind when going on a road trip. However, not putting some pre-trip thought and preparation into your journey, could cause a lot of unhappiness for humans and critters. Here’s how to hit the road with Rover (or Princess, or Sheba or Buster…) and some tips to make your expedition a travel dream come true. 1) Consider the Animal’s Needs – Driving long distances with a wailing, whimpering, quivering creature isn’t fun for anyone! Consider whether your pup is up for the trip. Cats are usually less interested in travel than dogs. A very young or very old pet might find your highway adventure too taxing, and be better off with a pet sitter. 2) Work Your Way up to Longer Trips – A motion sick or overly anxious pet means misery for everyone. If possible, get your pet used to vehicle travel when it’s young. Whatever their age, begin with quick outings, and then work up to easy day trips, before you tackle the long and winding road. Start them off travelling young, if possible. 3) Pack for Your Pet– Travelling without Buddy’s usual brand of food, puts you at risk that you won’t find the product elsewhere, which could lead to digestive upsets…and mess. So pack along your animal’s food and dishes, plenty of water, and a toy or two. Ensure you’re prepared with a leash, wet wipes for cleanups, waste bags, comfortable bedding for your pet, and a flashlight for walks in dark, unfamiliar places. If you’re heading somewhere remote, consider bringing a pet first aid kit. 4) Make Sure Your Pet is Identifiable – It can be easy (and tragic) to lose a pet while away from home. Be sure your critter has an identifying name tag which includes your name, address and a phone number that you can reached at while travelling. Carrying a photo of Fido will also help in the unfortunate event he or she goes AWOL. Tattoos and microchips can also assist with reuniting you and your pet. 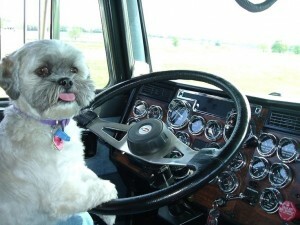 Ensure your animal companion is healthy, well-identified and equipped for the road. 5) Documentation for Crossing International Borders – Whether you’re travelling with a fish, dog, cat or monkey, it’s best to find out what the rules are for crossing an international border. Dogs entering the U.S. from some countries must have a certificate showing they have been vaccinated against rabies at least 28 days previously. 6) Seatbelts Everyone! – An unsecured pet can become a missile if you have to make a sudden stop. A loose critter can also distract the driver, block the driver’s view and get in the way of the vehicle’s brake, gas or clutch pedals. 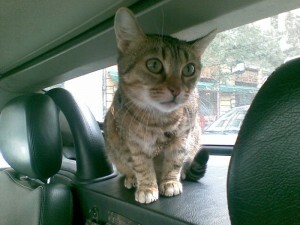 Train your cat (or small dog) to travel in their kennel, and secure the carrier with a seatbelt. Some pet harnesses are designed to work with seatbelts. If you use a crate for your large pet, make sure it’s anchored, and well cushioned inside. Driving with your canine loose in the back of a pickup truck is dog gone hazardous, plus you could get a ticket, as this video from the RCMP, BC SPCA and ICBC explains. 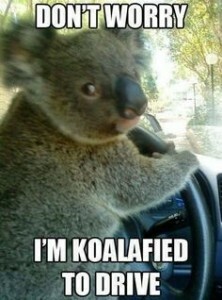 Never drive with your pet on your lap. Don’t let kitty become a CATapult – secure your pet in a carrier or harness. 7) Keep ‘Em Close While Far From Home – Yes, there’s that song The Cat Came Back and stories of lost animals travelling huge distances to return home, but do you really want the heartache of being separated from your pet in a strange place, and wondering if you’ll ever be reunited? Rather than counting on rhymes, fiction or fate to bring your beloved pet home, it’s best not to lose sight of them in the first place. When outside of the vehicle, keep your pet on a leash, and never let them approach wild animals. 8) Plan Stops for Bowser’s Usual Break Times – Regular breaks will give you and your animal a chance to comfortably relieve and relax yourselves. A little exercise and a water break is good for two-legged and four-legged travellers alike, so watch for rest areas, parks or other stops along the way. 9) Watch the Heat – Leaving an animal in a hot vehicle for too long will hurt or kill it. Heat can rise rapidly in a parked vehicle, so park in the shade and keep some windows open. If it’s extremely hot, bring the pet outside, keeping it secure in its carrier or on a leash. At the other extreme of the thermometer, don’t leave your animal in a vehicle if the temperature is near the freezing mark. 10) Plan Accommodations in Advance – Flying (or driving) by the seat of your pants when staying in paid accommodations, could leave you and Fluffy out in the cold. Research in advance where pet-friendly accommodations are along your route, and consider making reservations. (Some motels/hotels have a limited number of rooms for pets and their companions). Ensure pet-friendly accommodation is available and bring your animal’s favourite bedding. 11) Loosen up and Enjoy the Adventure – Being an uptight grump can spoil your good time. Your best four-legged buddy is there to have fun, so stop and smell the roses (or whatever else you find along the road) and enjoy the camaraderie of an adventure together. Animals can be great explorers, and they are always there for you. When travelling with an animal, your comfort and safety is linked to their comfort and safety. Think and plan for both you and your pet before you em… BARK. 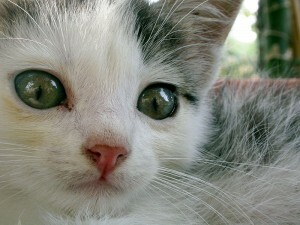 Thanks to the American Humane Society, PetVacations.com, Partnership for Animal Welfare and BC SPCA for their inspiring content. A good point Nick – thank you.